Nittaku Violin is known as the world’s first table tennis blade that is made with stringed instrument wood board joint technology. The manufacturing process is partly similar to the manufacture of violin, so this is the reason this blade is named as Nittaku Violin. As a unique blade production on the market, and its manufacturing process and material selection are different from other blades, the selling price is naturally high. It is priced at around $180. Nittaku Violin is hard, yet flexible with String Instrument Manufacturing Technology. It is another high-end table tennis blade from Nittaku which is made in Japan. According to Nittaku, the biggest advantage of stringed wood board joining technology is that it retains the natural elasticity of the wood itself more effectively than the traditional blade joining technology. Such technology making this blade can offer the player with higher speed and maintaining a good feel and stability at the same time. The most important thing is the player will always have the natural feeling of pure wood blade. Nittaku Violin is constructed with 5-ply pure wood. Nittaku has not disclosed the information on its use of wood. However, its unique face material is obviously manually selected. The wood grain is wider in the middle and narrow on both edges. The workmanship of the racket is quite meticulous. The only flaw is the handle will be a little bit bloated after the sweat infiltrates into it However, this is not a big issue as this can be easily ground with sandpaper. This is another high-end table tennis blade from Nittaku for all-round to offensive players (ALL+ to OFF-). 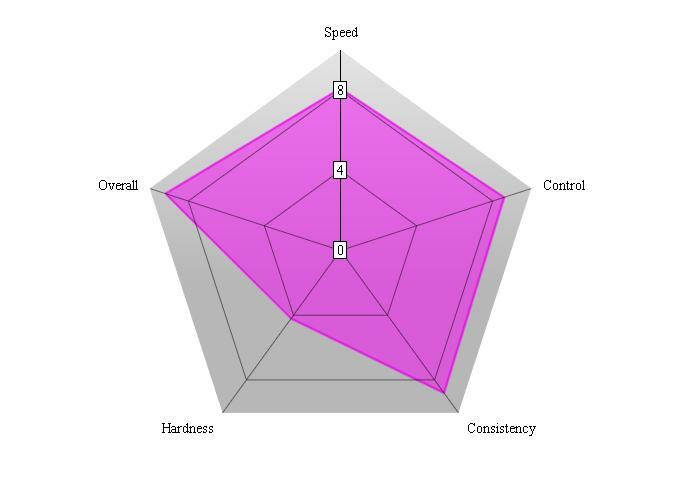 Even though it can not generate monstrous speed, it is very excellent for control and flexible play. If you try to do some forehand drives, you can have a very solid feel solid and you can benefit from the speed and high control of the blade. It is a very flexible blade with elastic vibration that is commonly used with hard rubbers, such as Butterfly Ternergy series, or DHS Hurricane. Most people love this blade is due to it is very easy for them to generate the spin that they want. It is an extremely flex blade ing loops and you can easily drive the ball on the table. As you can have longer dwell time with this blade, you can be loaded with spin when you are playing forehand loops. The prominent feature of this blade is on topspin loop. You can perform a very powerful, yet precise loop with relatively less effort. It also offers you easy, yet powerful backspin push with a low ball. In terms of block, it features a pretty good counter block with a decent precision for advanced players. On the other hand, intermediate players may find it a bit difficult since the blade is quite elastic. You can feel that you are in good control when you are doing blocking loops. Generally, this blade is good for you to perform looping when you are playing close to the table. It is recommended for advanced all round table tennis players who prefer spin overpower with a high budget. You can get the blade from Amazon. Let’s take a look at what is the differences between Nittaku Violin with some other similar blades. The Violin is thinner compared to Acoustic. The thickness of the Violin is 5.5mm while Acoustic is 5.7mm. Also, the Violin is slower and has more flex. Acoustic can let you play faster ball but is having less dwell time, less control and less spin than Violin. Violin carbon is crisper than the Violin. The speed is also further improved. Violin is more suitable for hard rubbers while Butterfly Korbel SK7 has a relatively soft surface, it is a bit more suitable for medium to hard surface rubbers. Korbel SK7 is also thicker with a thickness of 6.7mm. You can read more about Butterfly Korbel SK7 blade with this link. Butterfly Primorac Carbon is a thick blade with a thickness of 6.9mm. It is even thicker than Korbel SK7. The price is about $120 which is cheaper than the Violin. You can read more about Butterfly Primorac Carbon blade by following this link. If you are thinking of getting an alternative blade of Nittaku Violin, you can consider OSP Virtuoso OFF-. The OSP Virtuoso OFF- having almost the same features of Violin with great handmade craftsmanship. All in all, the Nittaku Violin is a very good piece of pure wood blade. It takes into account the feel of the 5-ply wood and the impact of the 7-ply wood. Of course, you can say that it has neither the speed of the 7-ply wood nor the spin of the 5-ply wood. I don’t object to such an opinion. However, the speed generated by the Violin blade is quite good among other 5-ply blades, and its feel is very clear. Controllability and stability that you can get from this blade are very unlikely to find from other blades. And because it is a 5-ply wooden blade, if you can exert good force when playing with it, the bottom strength that you can have is relatively good. 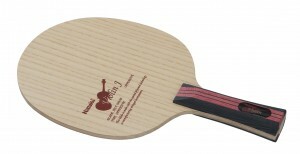 This blade is suitable for players who already master the foundation and basic skill of table tennis. It is especially ideal to be used to play mid or close table. By controlling the blade well, you can easily make a continuous attack. If you to play with an accurate drop point, the Violin can definitely become a good weapon for you to rely on! Other than Amazon, you can also get this blade from Megaspin.